Mostly light air, but a nice weekend on the water for week two of the spring series. Thanks to the Thistle fleet for making RC and dinner happen so well with so small a fleet. The scores for week 2 of racing at Lake Pleasant are posted on the results page, or you can click here. It was the first race Sunday morning, one of those famous first races of the day when the wind begins to die early. It was dropping fast as we rounded the windward mark on w/l, as we hoisted the spinnaker on our J/80, Melissa Kay. 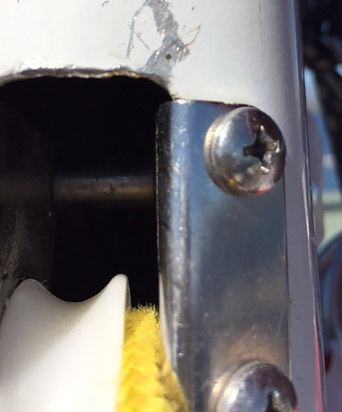 But as we did, the halyard jumped the sheave and jammed, leaving the spin a few feet short of a full hoist. More serious, we knew we wouldn’t be able to get the sail down. We were in second place in the smallish, five-boat Sunday morning Sportboat Fleet, with Chris Smith’s Sloop Dogg only a few boat lengths back. Dave Evans was a distant fourth, having jumped the start. Dog Year was fifth. The wind was shutting down for everybody except Dave, who was scooting up the west side with the only breeze on the lake. Bob Whyte suggested we give up on the race and take the time to send Maryellen up the mast to pry the halyard out of the gap next to the sheave. 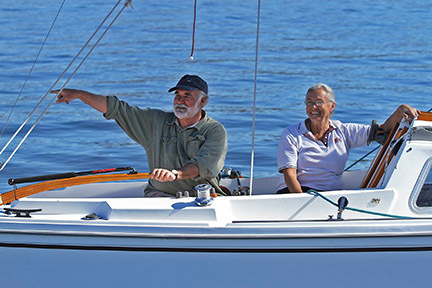 We dropped sails, Maryellen strapped into the bosun’s chair and Chris Hardin and Bob hoisted her to the top of the mast. By now the wind had completely stopped and even though Sloop Dogg had drifted past us, she was only a few boat lengths away. Amazing. Chris Smith saw that the only breeze on the lake was the one Dave was enjoying to the west and crept off to find it. Maryellen was still at the masthead. We were resigned to last place. She pried it loose and we brought her down. Wait, what’s this? A slight wisp of wind now ruffled across the water. Were we actually still in this race? We hurriedly raised sails and found ourselves on a rumb line to the leeward mark. We rounded, headed back north toward the finish line where we crept across in an amazed third place behind Steve Brown and Wendy and Dave’s Dog Year, which had found some wind too. Lake Pleasant, you are a fickle mistress. Our halyard issues weren’t over, of course. While leading the last race of Sunday morning, the thing jammed again and this time we were dog meat, retiring and limping into the slip, but still amazed at our good fortune.